Once you have generated a Calibre2opds catalog and then published it you will want to use it. This section of the documentation covers using it with a number of common client applications. Before you try and use the catalogs generated by Calibre2opds you will need to make sure that you know the IP address that will be required to access the catalogs over the network. If you are hosting the catalogs on your home network then you are likely to have a different IP address for accessing the catalogs locally to the one that would be used if accessing them remotely via the Internet. Many people store their libraries on an internet based machine using products like DropBox. As long as he product in use allows the files to be accessed via an URL, then this is no different to hosting the files on a web server. You can use Cloud Storage for hosting both the HTML and XML versions of the Calibre2opds catalogs. The big advantage of this approach is that these product nearly always include an automatic sync facility to copy files between local PC/Mac systems and the cloud storage. this means that the user does not need to worry much about the management of the files as it is automatic. It must be possible to access the ebook files that are to be downloaded using relative URLs. These tend to be standard functionality in most such products so they work without the user having to do anything special. The one thing that you do need to be careful about is security. If the product in use does not provide a security mechanism that can be used with the calibre2opds catalogs then you may be breaching copyright regulations depening on your country of residence. Generate either the OPDS (xml) version of the catalog or the HTML one. The default in calibre2opds is to generate both. Which variant you need will depend on what reading software or device(s) you are going to use. Generating only one variant of the catalog will halve the storage space used for the catalog. The options to control this are on the Catalog Generation Options tab. Use the option to “Minimize the number of changed files” on the Catalog Generation Options tab. This does not reduce space but it does try and minimise the amount of data that needs to be synced to the cloud after a calibre2opds generation run. This option is normally set by default, but you may want to check what you have it set to on your system. Use the options “Do not Generated resized covers” and “Do not generate Thumbnails” on the Advanced Customization tab. This avoids calibre2opds generating new image files optimised for this purpose and the catalog instead uses the existing Calibre cover.jpg files for this purpose. This will save significant storage space although it does mean that when you use the catalog more data has to be transmitted as you will be using image files for thumbnails and covers that are larger than is required. This is normally a desirable trade-off if you are using cloud based storage. Use the option to “Use external files for icons” on the Catalog Generation Option tab. By default the little icons at the front of lines in the catalog are embedded in the XML/HTML pages that are generated. Using this option will instead reference files stored on the server. This reduces slightly the size of the files generated for each page in the catalog at the expense of slightly slower times to load the page when using the catalog. The space savings from this are minimal so many users do not bother. The XML catalogs generated by Calibre2opds are based on the OPDS standard. The XML catalogs can be used with some browsers, but do not seem to work with all browsers. In particular they do not work with Microsoft Internet Explorer. If you want to access the XML catalogs then Firefox is the recommended choice. However in most cases you would be better off using the HTML variants of the catalog when using a Browser. A more normal usage of the XML versions of the catalogs is to access them via reading software that is OPDS aware. Examples of common software that falls into this category are given below, but the catalogs should be usable by any software that supports the OPDS standard. HTML catalogs are designed to be accessed by a Web browser. When using the HTML catalogs you would normally point your browser at the top level file called catalog.html. This would therefore be the last part of the catalogpath defined in nthe URL mentioned above. More detail on using a browser with the HTML version of the catalog is shwon later in this section. Calibre2opds can generate its catalogs in both XML and HTML formats. Which one you use is up to you, but you should be aware of the fact thtat not all browsers can handle the XML format. Therefore if maximum compatibility with browsers is your aim you should generate HTML catalogs. 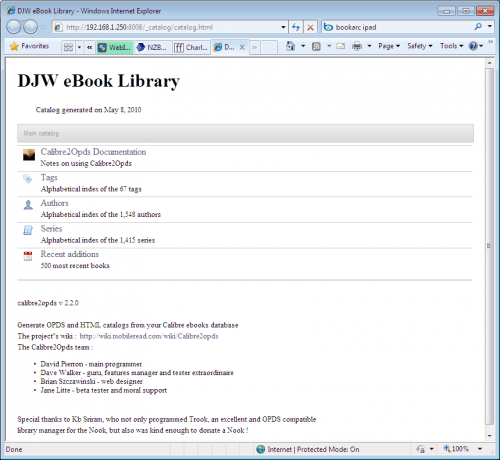 Many modern book readers which are WiFi or 3G enabled to enable them to download books over the network include a built-in web browser and can download books from a web page using this built-in browser. Common examples of such devices are the B&N Nook and the Amazon Kindle. address is the network address to access the server hosting the Calibre2opds files. This can either be a network visible server name or an IP address. port’ is the port that will be used to access the files. It is only required if you are not using the default HTML port of 80.
catalogpath is the path to access the relevant catalog file. Note that if you have generated the Calibre2opds catalogs to be accessed via SSL encryption then you would use https:// instead of http:// at the start of the URL. Most computing devices or smartphone support a web browser, so this is a common way to access the calibre2opds catalogs. You would normally start at the top level of an HTML based catalog with the default calibre2opds generated index pag (with a filename of index.html). 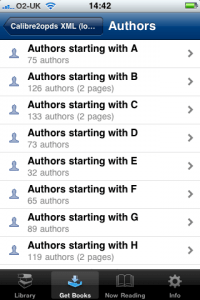 This shows a drill down into the Authors section. You will see that as this is a large library, the authors have been sub-divided by the first letter of the authors name. The books can be displayed in two modes. The following shows ‘cover-browse’ mode. Which of these two modes is used is a mconfiguration option when the catalog is generated. 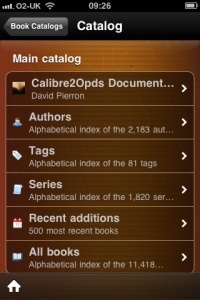 If you are using an iPhone, iPod Touch or iPad as your reading device, then as long as you are using iOS4.0 or later then you can download books from the HTML version of a calibre2opds generated catalog via the Safari Web browser (that is standard with iOS) into any application that during its installation has been configured to handle the relevant file type. At the bottom of the page you will see a series of download links for each of the book formats that you have in your calibre2opds library that are available via the calibre2opds catalog. If you click on the button to open the file with iBooks, then the file will be downloaded into the iBooks library, and then iBooks will be started with the book opened to the first page. You will notice that there is also an Open with option. Pressing the button will give a list of the applications that have registered themselves as being capaqble of handling this file type. 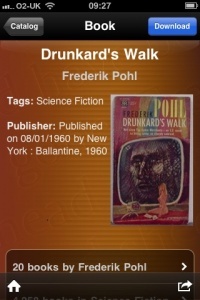 the followoing shows an example where several applications have registered themselves as being capable of handling the ePub file type. 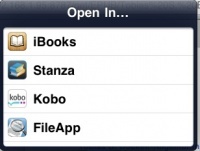 Not surprisingly iBooks is on this list, plus any other suitable eReader type apps that are installled. 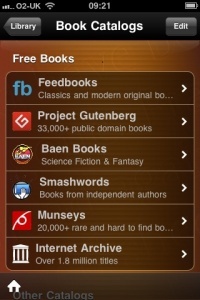 Selecting the relevant app will load the book into that application. There are a wide variety of erader software packages that support the OPDS standard for downloading books. At the moment there do not appear to be any specialist eReader hardware devices that support the OPDS standard in an ‘out-of-the-box’ state although this is likely to change in the future. The remainder of this section shows how to set up a number of eReader software packages to work with a calibre2opds generated OPDS catalog. The ones described are by no means an exhaustive list, but should act as representative examples of the approach that should be used. MegaReader and QuickReader are variants of the same software for reading books on iOS devices (iPhone, iPod Touch/iPad) and have the same level of OPDS catalog support. 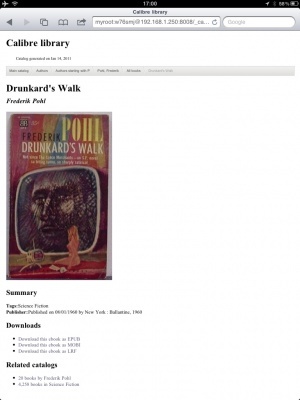 eBook Search by the same author provides the OPDS catalog support without the reading capability so that it can act as am OPDS front end for loading books into other iOS reading software that does not support OPDs directly (e.g. iBooks, BlueFire, GoodReader, Kindle reader). 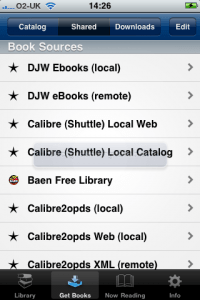 If you are using any of these applications on an iPhone, iTouch or iPad then you will want to add your Calibre2opds as a user-defined catalog. 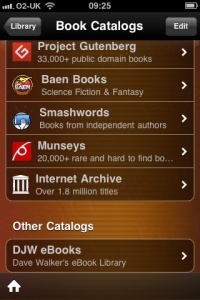 This will allow you to browse the catalog, and download any books that you want to read. These applications are treated as a unit here as the OPDs aspects of configuring the application for an OPDs catalog and then using it download are basically the same in all these applications. The process of adding a calibre2opds generated catalog to all these packages follows idential lines and uses the same set of dialogs so they are all treated as single entity for the purposes of this document. The screenshots are from the iPhone versions of the app, but the iPad dialogs have the same content merely adjusted for the larger screen size. 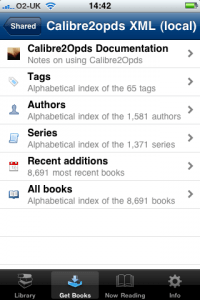 To add a calibreopds catalog to you start by selecting therLibrary tab. From there you select the Download Books option near the top of the screen. Clicking on this takes you to the dialog where you can define a new catalog. Here you would set up the URL for your calibre2opds generated catalog. The following screenshots show typical entries for such a catalog. The right-hand screenshot shows how you can preset a username/password in the URL. Quickreader does not remember username/password across reading sessions, so this avoids you having to enter it every time. When you have completed setting up the catalog and press Add then Quickreader will verify that it can access the catalog you have just defined. After verifying this you are returned to the previous dialog. You will see that the new catalog you have just set up appears under the Other catgory. The library you have configured will be displayed in the Other Section. You can select your library and you will then be shown the top level index of your calibre2opds catalog. You can drill down to the book you are interested in. The following shows the Book Details page for a book entry. There is a Download button at the top right. If you press this then the book will be downloaded. At this point you can either start reading your book, or return to your main Quickreader library where the book will now be listed and be available for reading at a later date. 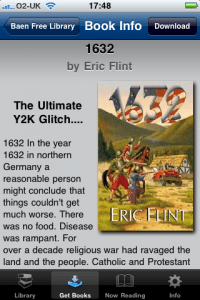 Stanza is an iOS based ereader app. 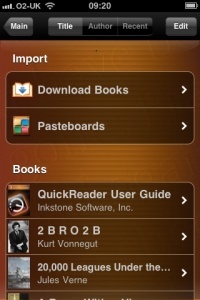 Stanza was one of the first eReader type applications on the iPhone , and as a result it has been very widely installed. It was also a leader in providing support for the eaerly versions of the OPDS standard. Stanza versions earlier than v3.2 do not run on iOS5 (or later) which has caused problems for users of older generations of iOS based devices such as early iPhones and iPads.Stanza v3.2 does run on iOS 5 devices although there have been some reported problems that users have encountered..Support and maintenance of Stanza has been discontinued by Amazon (who are the current owners of Stanza) so it does not look like these issues will be resolved. Despite the above issues there is still a very large installed base of Stanza users so it is still an important software package in the iOS markey. If you are using the Stanza application on an iPhone, iTouch or iPad then you will want to add your Calibre2opds as a user-defined catalog. 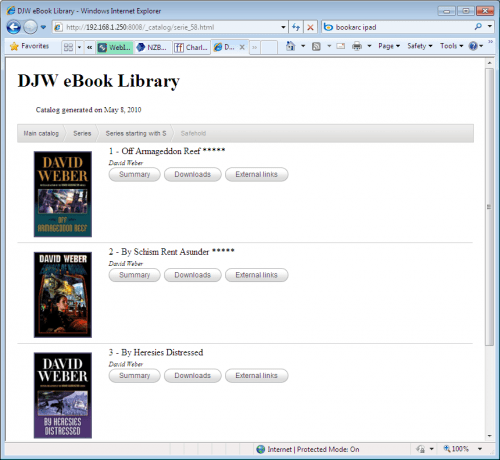 This will allow you to browse the catalog, and download any books that you want to read. 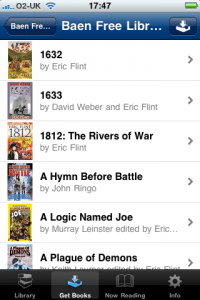 Start by selecting “Get Books” from the options at the bottom of the screen, and the “Shared” at the top of the screen. This will bring up the list of custom Book sources that you have previously configured. If you have not previously added any then this list will be empty. In the above list you see that there are entries labelled (local) and (remote). The reason for this is that i this particuar case the eBook library is being hosted on a Web Server located on the home network. The IP address to access this web server is different if using the home WiFi network compared to accessing from the public internet. The (local) entries are therefore used if at thome, and the (remote) ones are used when away from home. If you are using something like DropBox to host your eBook library then you will probably only need a single entry as the same address can used both at home and on the move. 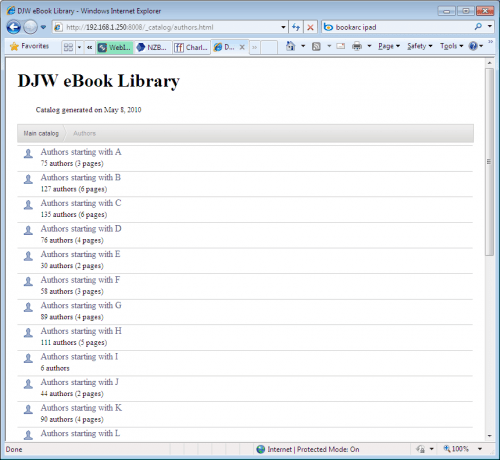 Click on Edit to go into the dialog for editing the list of Book sources. 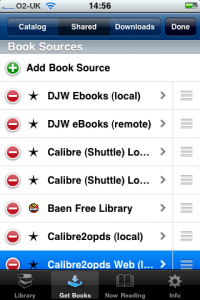 You can now add a new source by selecting the Add Book Source option, or edit any of the existing sources. Re-order the Book Source entries by using the 3-bars icon. You can now give the name that you want displayed in the list of Book Sources and the URL for accessing the first page in the catalog. You will also see that you can add both catalogs and Web pages via this dialog. Make sure this option is set to Catalog for a Calibre2Opds catalog. If you need to make a change you can later go in and change the settings. Note however that you cannot change an entry from being a catalog entry to a web page entry. If you want to do that you need to delete the entry and then create a new one. This is an example of the settings for accessing a Calibre2Opds catalog that has been hosted on a web serve on the local WiFi network. If you are not sure what the URL is to use with Stanza, you can first test it using a browser. Although the browser may not display the catalog correctly it should still show a web page that has the basic structure of the catalog. If the page does not display then either you have the URL wrong, or a firewall is blocking it at the server end. 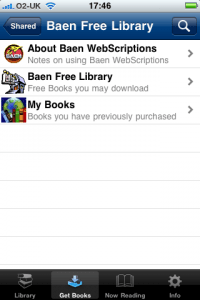 The above example is for the Baen Free Library – books that are published commercially in paper format but are available for free download in eBook format. 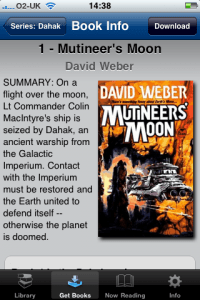 Baen books are a heavy promoter of eBooks, particularily of the Science Fiction and Fantasy Genre. They offer good prices and their books are available in a variety of formats and unlike many other publishers are not DRM (Digital Rights Management) protected. If you have got Stanza configured correctly, then when you select the Calibre2Opds catalog entry from your list of Book sources you will get the top level of the calibre2Opds catalog displayed. Using Calibre2Opds online catalogs means that you do not need to keep lots of eBooks loaded into Stanza as you can download them on demand. The Calibre2Opds catalogs also provide ways of browsing your library that are not supported by Stanza such as by series or books recently added to your Calibre library. The Structure of this catalog is organised to give you a number of ways of getting at the same book. Which one is most appropriate will vary according to just what you are currently trying to do. From this list you can drill down a level. The sub-divisions are on the first letter of Author Surname. From the list of authors you could select the one you are interested in. 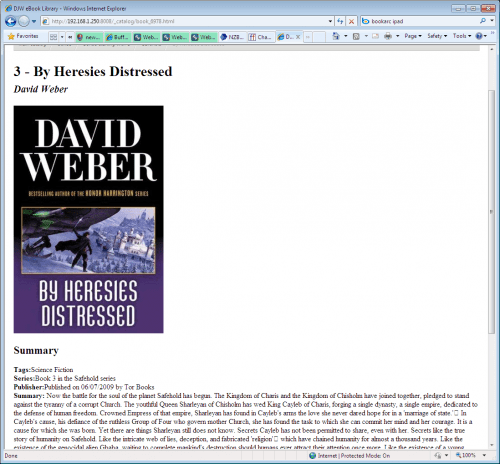 In the following dialog David Weber has been selected. If for example a the series Dahak was selected this would then display a list of books that are part of that series. Note that this series listing will also include any books by other authors that are part of the series, but since the author is given under the Book title it is easy to see which ones belong to this author. 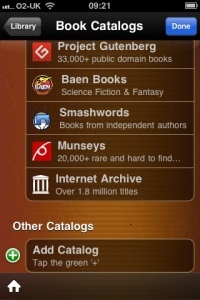 Just like with Stanza catalogs you can drill down to specific books, although the information about the book will be displayed in whatever layout Baen have selected. However since it is still Stanza displaying the information it will follow the same basic layout as books displayed from a Calibre2Opds catalog. From here you could download the book using the Download button. Calibre2opds is best utitlised on a Nook system that has been soft-rooted and has the Trook software installed. Trook can then use the calibre2opds generated catalogs as the way of indexing/finding the books you have loaded. The Kindle comes with a web browser that can be used to access the HTML version of the calibre2opds generated catalogs. Kindle users are encouraged to provide screen shots to help complete this section.